One of the main drawbacks of monitoring systems is that more often than not, the equipment used to monitor the person's vitals is either bulky or interferes with one's normal routine. 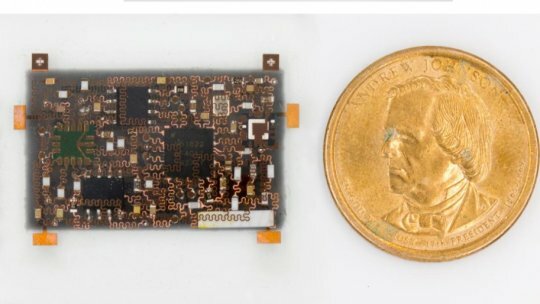 In order to remove this flaw, researchers from the University of California San Diego have combined 3D printing with circuit fabrication to create "stretchable electronics" that remain multi-purpose whilst being a fraction of the size of similar circuits in the market. These devices are normally as small as a US dollar coin, and they can be used to monitor various readings in the body, from respiratory functions to heart and brain activity. Furthermore, since the device is stretchable, it can be stuck on a person's body and function as an "electronic bandage." When it functions as an e-bandage, the device makes full use of its multiple sensors, with the readings being dependent on where the device is placed. For instance, if it is placed on the chest, it can function like an electrocardiogram, while it can record brain signals if it is placed on the forehead. The device's applications also extend beyond the field of medicine, for it can also be fitted with various modules for a wide variety of purposes, from Bluetooth to WiFi. Combine this with its heavyweight power supply and excellent performance record, and you get an invention that, as one of the developers put it, is a "master of all trades."